So here's something that we are a little puzzled about. The Economist is undertaking a poll to see which American Presidential candidate is favored by the world. In a very blue worldwide map, rooting for Obama, two noticeable yellowish spots, Macedonia and Georgia. McCain, of course, is popular in Georgia for having said "Today we all are Georgians" during the recent conflict. He has also previously visited the country, and apparently a missile was fired at his helicopter as he was flying over South Ossetia. His willingness to stand up to Russia, directly, makes him understandably popular in Georgia. Now what puzzles us a little is that, according to The Economist, Obama apparently is more popular in Azerbaijan and Turkey. Is that really the case? Obama has been very outspoken about recognizing the Armenian genocide, and enjoys full support by the Armenian caucus, a sizable group of American legislators (apparently nearly one third of all legislators belong to it). So pronounced is this issue, that it has been described by The Atlantic as "McCain's Armenia problem"). So does that matter for comparing candidates? For more depth, let's turn to Gallup World Poll (and we will be writing more about some of their impressive work in the region soon). 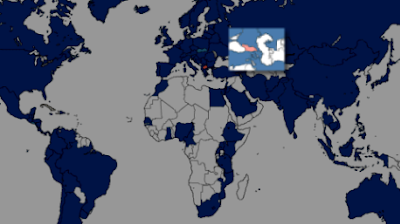 While Gallup has no data on Armenia and Azerbaijan, they have asked this question in Turkey and Georgia. And here lies one clue: in Turkey, 22% are pro-Obama, 8% pro-McCain. But 70% say they don't know, or refuse to answer. In Turkey, at least, the popularity of Obama, is based on the majority not having made up its mind yet. If Obama is elected, some delicate questions need to be resolved. See, again, the Atlantic article on this. The data is, as far as we know, pre-conflict, collected in July, therefore the Georgian preferences may not be up to date: 15% Obama, 23% McCain, 62% Don't Knows/Refuse. So here, the race is pretty far away, too. 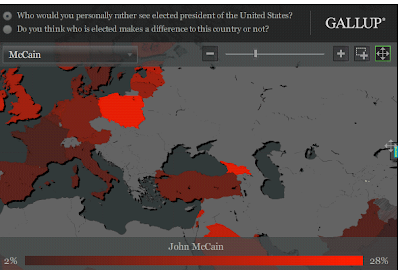 Compare with the most extreme pro-Obama country, the Netherlands: 74% Obama, 10% McCain, 16% Don't Knows/Refuse. Does the election matter to the world? Go to the Gallup website, and their nifty online data presentation, to find out more.